Even if Congress acts now to rid the Defense Department of looming sequestration spending cuts, it will take years of stable and higher budgets for DoD to dig out of the readiness hole, Defense Secretary Jim Mattis told the Senate Armed Services Committee today. The secretary discussed the President's fiscal year 2018 defense budget request with the senators. As in his testimony to the House Armed Services Committee last night, he urged the senators to repeal sequestration and give the department stable budgets to work with. "I retired from military service three months after sequestration took effect," Mattis said. "Four years later, I've returned to the department, and I have been shocked by what I have seen about our readiness to fight." The troops bore the brunt of sequestration, he said, and carried on the worldwide deployments needed to keep America safe. "But our troops' stoic commitment cannot reduce the growing risk," the secretary said. "It took us years to get into this situation. It will require years of stable budgets and increased funding to get out of it." "When Congress approved the all-volunteer force in 1973, our country never envisioned sending our military to war for more than a decade without pause or conscription," Mattis said. "America's long war has placed a heavy burden on men and women in uniform and their families." "A third force is adversaries actively contesting America's capabilities," Mattis said. "For decades, the United States enjoyed uncontested or dominant superiority in every operating domain or realm. We could generally deploy our forces when we wanted, assemble them where we wanted and operate how we wanted. Today, every operating domain -- outer space, air, sea, undersea, land and cyberspace -- is contested." "Each of these four forces … requires stable budgets and increased funding to provide for the protection of our citizens and for the survival of our freedoms," he said. "I reiterate that security and solvency are my watch words as secretary of Defense." The fiscal 2017 budget started the road back to readiness, the secretary said. Congress granted an additional $21 billion to address vital warfighting readiness shortfalls. The fiscal 2018 request is for a $639 billion top line. This is a 3 percent increase and will allow the department to continue rebuilding readiness, Mattis said. The fiscal 2019 budget will benefit from a strategy review already underway in the Pentagon, he told the panel, adding that he anticipates that request will ask for a top line that's 5 percent higher. 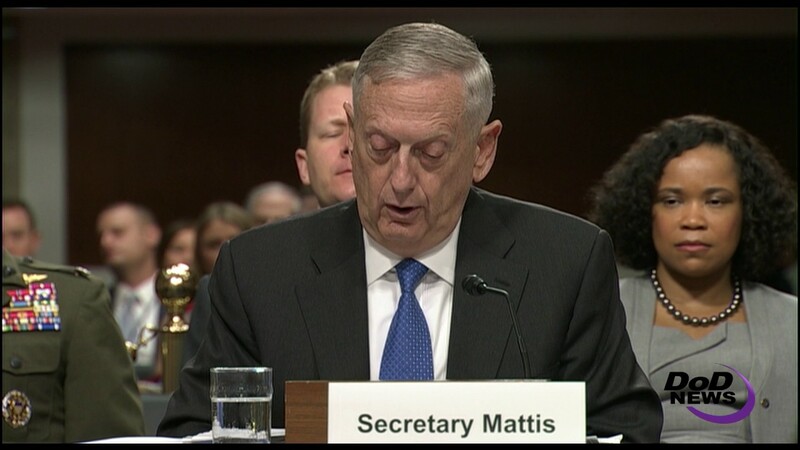 "Moving forward, the [fiscal] 2019 budget, informed by the national defense strategy, will have to make hard choices and reshape the 2019 to 2023 defense program," Mattis said. "The department will work with President Trump, Congress and this committee to ensure future budget requests are both sustainable and provide the commander in chief with viable military options that support America's security."